Johnston, C. Fred. "Francis Amyot". The Canadian Encyclopedia, 26 July 2015, Historica Canada. https://www.thecanadianencyclopedia.ca/en/article/francis-amyot. Accessed 19 April 2019. Canoeist Francis Amyot following his gold medal win at the 1936 Berlin Olympics, Canada's only Olympic gold that year. 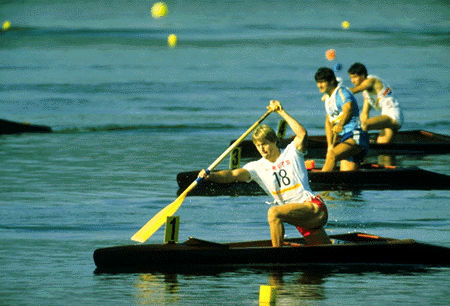 Over 6 feet tall, he required a custom-made canoe to accommodate his large frame and powerful stroke (courtesy Canada's Sports Hall of Fame, www.sportshall.ca). Francis Amyot, Frank, paddler (b at Toronto, Ont 14 Sept 1904; d at Ottawa 21 Nov 1962). His father, Dr John A. Amyot, was federal deputy minister of health. 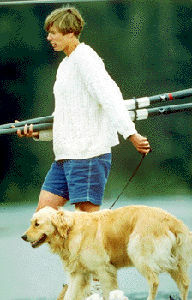 In Ottawa Frank Amyot canoed at the Rideau Aquatic Club and the Britannia Boating Club. 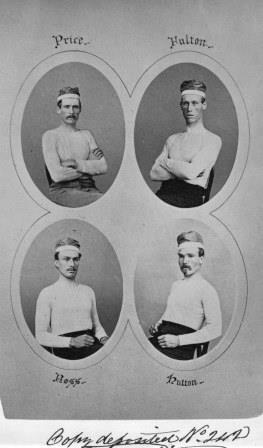 A large man at 188 cm and 84 kg, he required a custom-made racing shell and paddle to accommodate his long, powerful body stroke. Frank Amyot won 6 national senior single-blade singles championships between 1924 and 1935. In 1936 he was coach, manager and a member of the first Canadian Olympic canoeing team and at Berlin won a gold medal in the 1000 m race. He served in the RCN during WWII and later was an organizer of the Rideau Canoe Club.